App names and icons are important, as they let users easily identify your app amongst other apps on their devices. When you are in the Designer, click on "Screen 1" in the "Components" section of the designer. 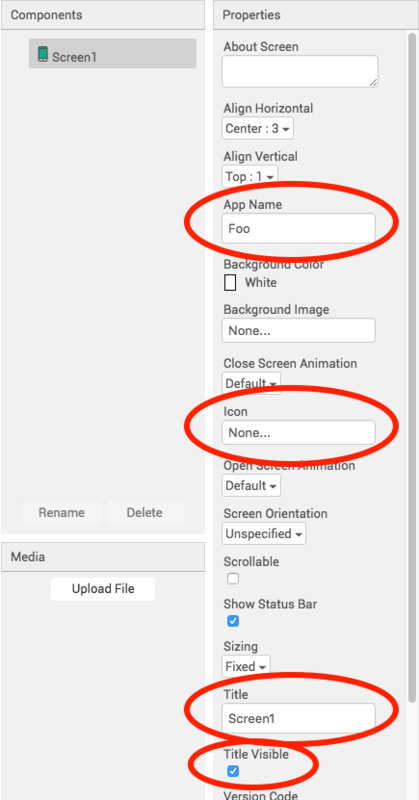 To Change the App Name: Change the text in the "AppName" property to be the name you want your app to be. Note the AppName, and not the name of your Thunkable app project, will be the name of your app. To Change the App Icon: Click on the "Icon" property and select an image you would like for the app icon. To change the Title Bar Name: Change the Text in the "Title" property to be the name you want the title bar on the app to say. To remove the Title Bar: Uncheck the TitleVisible option.